Metric Insights users may access the system via an existing Google account rather than providing Metric Insights account username/password. Google's OAuth2 / OpenID API is used by MI to authenticate and get user info for syncing. Before configuring authentication parameters in Metric Insights, follow the procedure described to access Google APIs. This facility makes use of the PHP client library described here. To configure these parameters, refer to Registering Your Server with Google to use their Plugin Resources or Google Developers documentation, or contact Metric Insights support team. 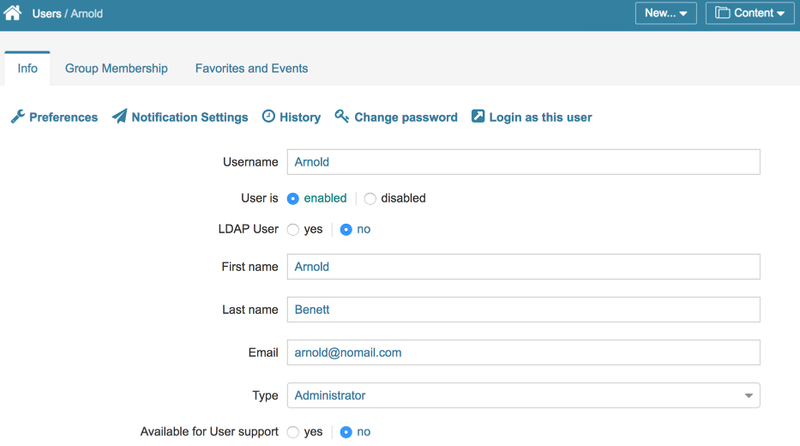 Set GOOGLE_OAUTH2_LOGIN parameter to 'Y' to enable user authentication and authorization via Google's OAuth 2.0 APIs. Refer to Step 2 to see this option in action. Optional. You may use this parameter to restrict the login to Metric Insights application to only accept authentication requests from users with an email on a specific domain name or set of domain names. Click Save changes to apply new settings. Once the GOOGLE_OAUTH2_LOGIN option is enabled via the Configuration Parameter, a Google Sign in button is shown in addition to the standard MI Login button. 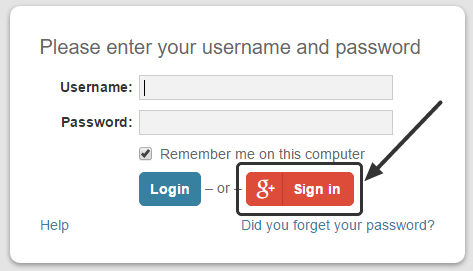 Click this button in order to login to Metric Insights via the Google account. 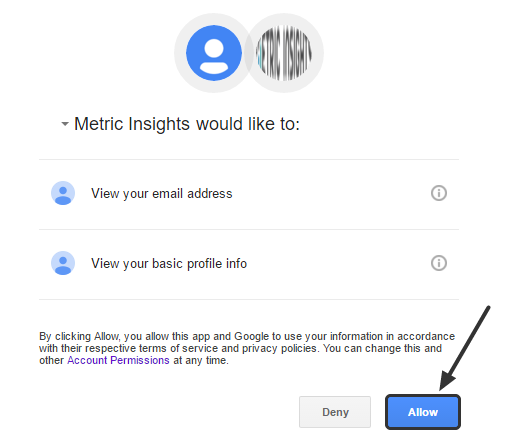 When logging in to the Metric Insights application via Google account for the first time, the user shall provide consent for the application to perform the specified actions. Once the application receives user's permission to view his basic profile information, Metric Insights automatically creates (or updates) a user account based on the information received and a user is logged in the application on Homepage.